Last edited by elmuerte; 2009-08-25 at 08:13. You moving to a new house? Note: I guess this is not a change of hardware/software. Just a physical move. The machine the MBN is running on will be physically moved to a new location. - elmuerte: Honestly, I don't understand, what you're waiting for, in order to upgrade the vBulletin here to version 3.8.x. Honestly, every other vBulletin forum I'm a a member of, is already using 3.8.x, only this forum is still using 3.7.x. Well, he could always use the downtime to add stuff to MagicBall Network. If every forum jumps of a bridge, should this forum also jump off a bridge? How can a forum jump off a bridge? And btw, is there anything worthwhile in this new version at all? It has MOAR, which is clearly, why there is a one-man, tornado, trying to buttrape El into, switching. vBulletin 3.8.0, according to this page, mainly has a lot of improvements for social groups, something that the MBN doesn't have and, considering the small userbase, doesn't really need either. How can a chicken cross the road? Walk from one edge to another? Thanks for let us know El. Approximately how long will the MBN be unreachable ? Last edited by elmuerte; 2009-08-24 at 19:08. 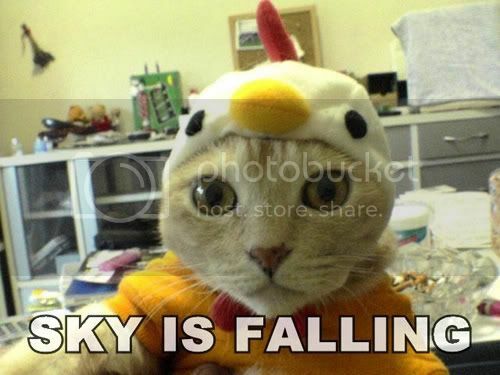 I hope that cat is having a cluckity cluck cluck day. Didn't notice the down time . It was fast!